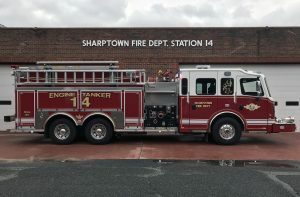 The officers and members of the Sharptown Vol Fire Department Inc. would like to extend an invitation to join us on Sunday, September 10, 2017 from 1-4PM for the housing of our new Engine Tanker 14. There will be light food and refreshments served. There will also be fire truck rides as well as a smoke house provided by Willards Volunteer Fire Co. for the kids. The Sharptown Fire Prevention Queens will be passing out goodie bags for the children as well. Again, we extend this invitation to you in hopes that you will be able to join us. Without your continued support though the years, we would not be where we are today.